Yen trades generally lower in rather quiet markets today. Risk appetite strengthens mildly despite extended record run in US government shutdown. There were rumors that US is considering to roll back tariffs to facilitate trade negotiation with China. But that was quickly denied. Nevertheless, Fed’s “patience” rhetorics continued which is sentiment supportive. For the week, Sterling continues to ride on Theresa May’s Brexit deal defeat and stays the strongest one. Dollar follows as second strongest, with a little help from rebound in yields. Kiwi is the weakest one followed by Swiss Franc. Technically, GBP/USD’s rebound form 1.2391 resumed by breaking 1.2930 overnight. Further rise would be seen to 1.3174 resistance. EUR/GBP is also on track to 0.8655 low as fall from 0.9101 extends. GBP/JPY’s strong break of 139.88 resistance now raises the chance of larger trend reversal. 143.93 minor resistance is the next hurdle. USD/CHF is also getting closer to 0.9963 resistance. Break there will confirm completion of recent corrective pull back from 0.9963. In other markets, Nikkei closed up 1.22% at 20650.64. Hong Kong HSI is currently up 1.21%. China Shanghai SSE is up 1.15%. Singapore Strait Times is up 0.26%. Japan 10-year JGB yield is up 0.0035 at 0.015. Overnight, DOW rose 0.67%. S&P 500 rose 0.76%. NASDAQ rose 0.71%. 10-year yield rose 0.018 to 2.749. But 30-year yield ended flat at 3.077. WSJ reported yesterday that US Treasury Secretary Steven Mnuchin was considering the idea of lifting some of even all of extra tariffs on Chinese imports to facilitate trade negotiation with China. But a Treasury spokesman quickly denied. Mnuchin is widely considered a dove in the trade war with China, and he has rather good relationship with Chinese Vice Premier Liu. So we won’t be surprised if Mnuchin has considered or even brought out such idea. But he is often seen as isolated by others in the team on the issue. So, it doesn’t really mean a thing even if he did make that suggestion. Liu has confirmed his scheduled to visit Washington on January 30-31. The result of the meeting with USTR Robert Lighthizer then is the real key and the whole negotiation. Swiss will release PPI in European session while Eurozone will release current account. But main focus is on UK retail sales. Later in the day, Canada CPI will catch most attention. US will release industrial production and U of Michigan consumer sentiment. Daily Pivots: (S1) 1.2878; (P) 1.2940; (R1) 1.3047; More…. 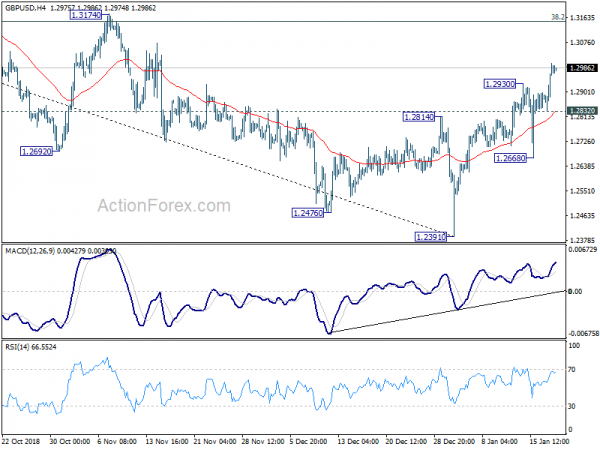 GBP/USD’s rebound from 1.2391 resumed by taking out 1.2930 and reaches as high as 1.3001 so far. 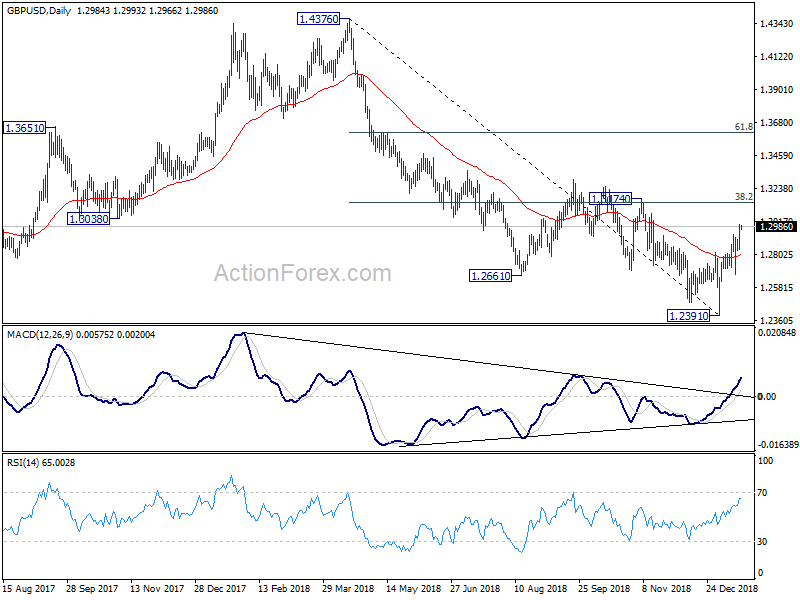 Intraday bias is back on the upside and current rise should target 1.3174 resistance, which is close to 38.2% retracement of 1.4376 to 1.2391 at 1.3149. As such rebound is seen as a corrective pattern, we’d expect strong resistance from there to limit upside, at least on first attempt. On the downside, below 1.2832 minor support will turn intraday bias neutral first. But further rally will remain in favor as long as 1.2668 minor support holds.